Duane M. Anderson, 66, of Iowa City, passed away Monday, December 3, 2018 at The University of Iowa Hospitals and Clinics. A gathering time will be held from 4-7 PM, Monday, December 10, 2018 at Lensing Funeral & Cremation Service, Iowa City. At a later date, a memorial service will be held in Goodell, IA. In lieu of flowers, memorials may be made to The Duane Anderson Memorial Fund. Duane was born on November 12, 1952 in Belmond, IA the son of Leonard and Maryln (Dorr) Anderson. He was united in marriage to Debbie Scott on May 20, 1978. Duane worked for The University of Iowa for 34 years, retiring in 2014 from the College of Dentistry as the facility manager. 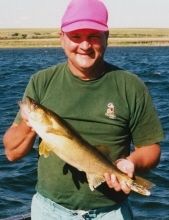 He enjoyed all things outdoors, especially fishing and hunting. Duane was a great storyteller and amazing cook. He had a great sense of humor and enjoyed golfing. Duane was exceptionally proud of his granddaughter, Princess Ruby. Duane is survived by his wife, Debbie; son, Mike (Sara Schwartz) Anderson and their daughter, Ruby Anderson of Iowa City; seven siblings, Mary Ellen Mason of Goodell, IA, Mike (Kathy) Anderson of New Hampton, IA, Evelyn Nolte of Goodell, IA, Theresa (Dan) Beck of Minden, NE, Terry (Judy) Anderson of Ames, IA, Annette (Miles) Schallert of Highlands Ranch, CO, and Tony (Terry Pressley) Anderson of Arroyo Grande, CA; and many extended family. To send flowers or a remembrance gift to the family of Duane M. Anderson, please visit our Tribute Store. "Email Address" would like to share the life celebration of Duane M. Anderson. Click on the "link" to go to share a favorite memory or leave a condolence message for the family.